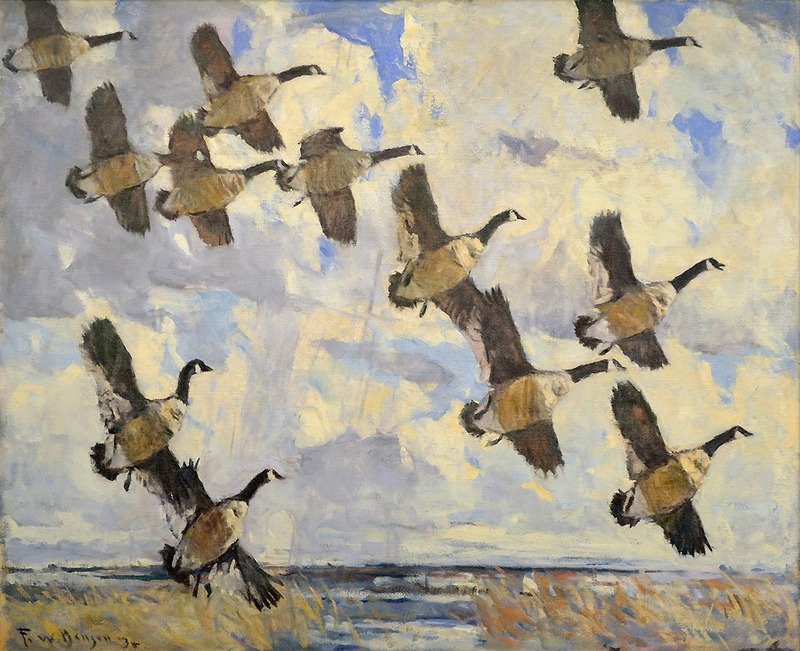 J. N. Bartfield Galleries has handled many magnificent works in its long history. Four standouts will give you some idea of the scope and grandeur of of offerings. 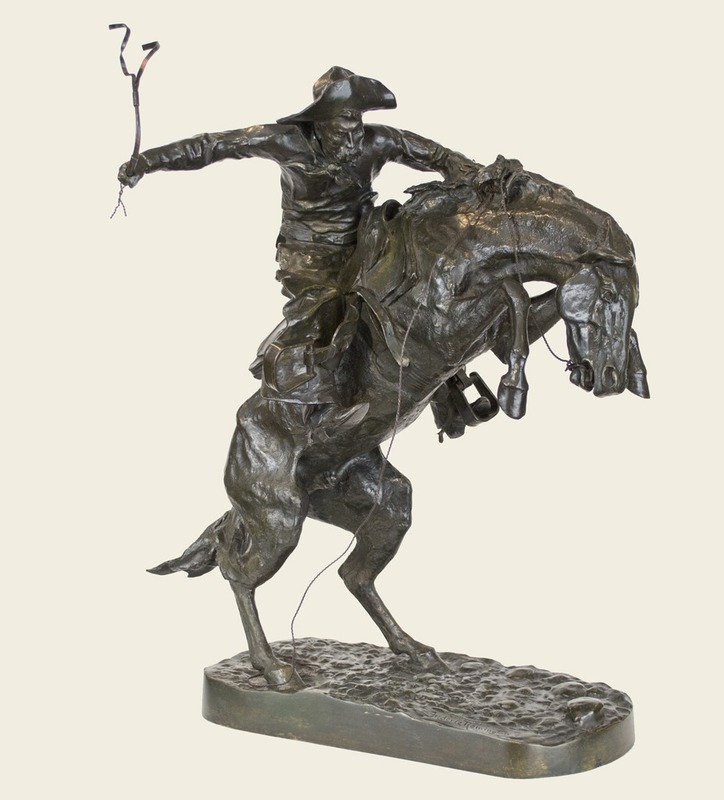 Frederic Remingtons works are a mainstay at Bartfields. 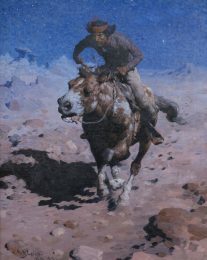 One of many major Remingtons is The Lone Scout, a 20 x 26 inch oil executed in 1906, when the artist had mastered his media and reached the summit of his artistic powers. 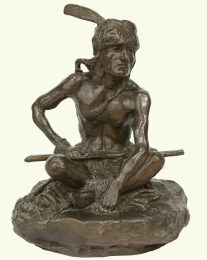 in it, a single Native American in a desolate and forbidding landscape watches over a thin waterhole that juts into the picture plane opposite his horses nose. Dry scrub provides scant relief for the viewers eye and the alkali mountain ridge beneath a hot, cloudless blue sky is almost Martian in aspect. The darkest and most palpable element in the painting is the shadow of mount and man. 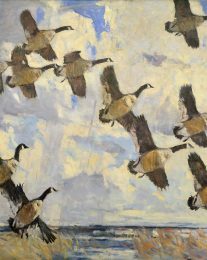 Where we would wilt, the braves remarkable vigilance forms the core of the work. 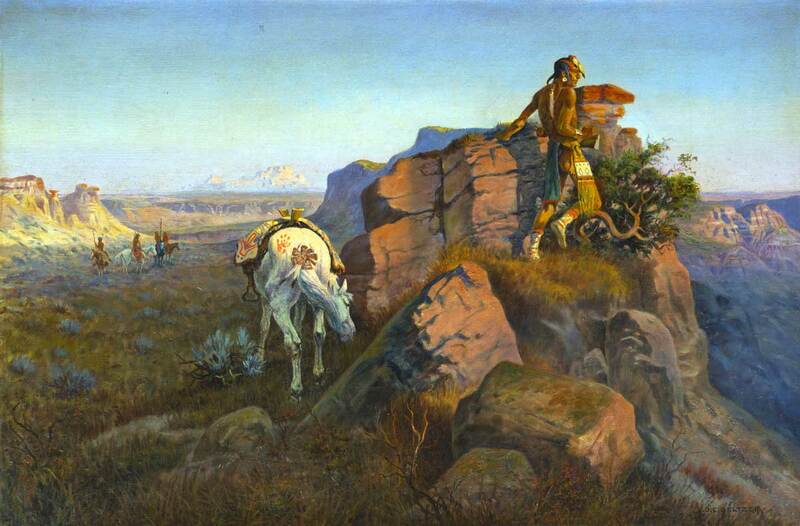 Charles M. Russells impressive 1914 oil, Whose Meat?, depicts the first moments in a standoff between man and the beast that walks like a mana grizzly bear. 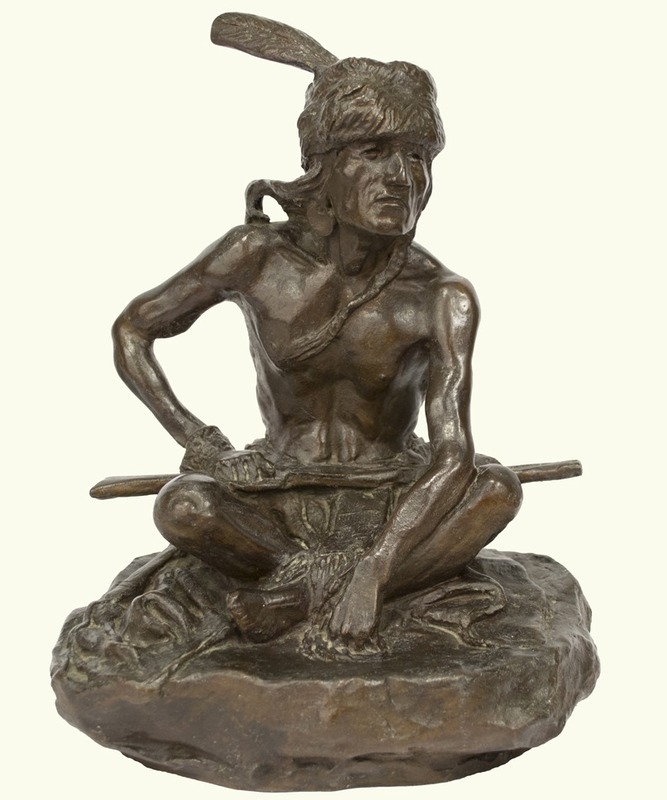 The hunter, having just shot a bighorn sheep, sees an upright grizzly closing on his game. 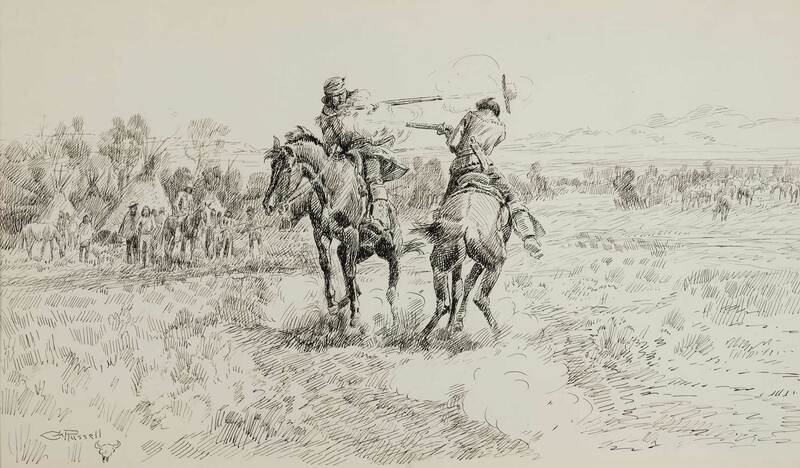 Holding his shying horses, he tries to mount his rifle. The moment is supremely tense, and Russell deftly heightens this by positioning the hunter on a slope of slippery boulders backed against a cliff face. Snow on the ground and the clouds rising behind the bear hint at a quick squall that might belie the beautiful snow-capped, sun drenched peaks in the distance and obscure the scene in freezing fog. Whose Meat? becomes What Next? 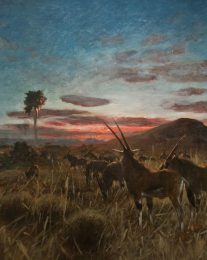 Albert Bierstadt, Hudson River School master, took his talent West in 1859. The majesty of Yosemite was just one of the many spectacular natural wonders he painted. In 1866, Bierstadt was commissioned to paint a picture for the rotunda of financier Le Grand Lockwoods home in Norwalk, Connecticut. Before the finished painting, Domes of the Yosemitewhich measured 9 1/2 x 15 feetleft the artists studio, Bierstadt painted a smaller version so it could be reproduced as a chromolithograph. With great attention to textures, he gives us a view of Upper Yosemite Falls on the left and the Merced River winding its sinuous way toward Half Dome. Shafts of light and the framing of the composition give the effect of a window into a lost Eden. N. C. Wyeth, known for his classic illustrations of novels like Treasure Island, also painted a number of magnificent Westerns and Roping Horses in the Corral is arguably the finest of these. Steeped in the dust and sweat of the cowboys life and work, the painting is a study in power against power, muscle against against muscle. The horses nostrils flare. Their manes fly. Their eyes are wild and their sinews are braided tightly. 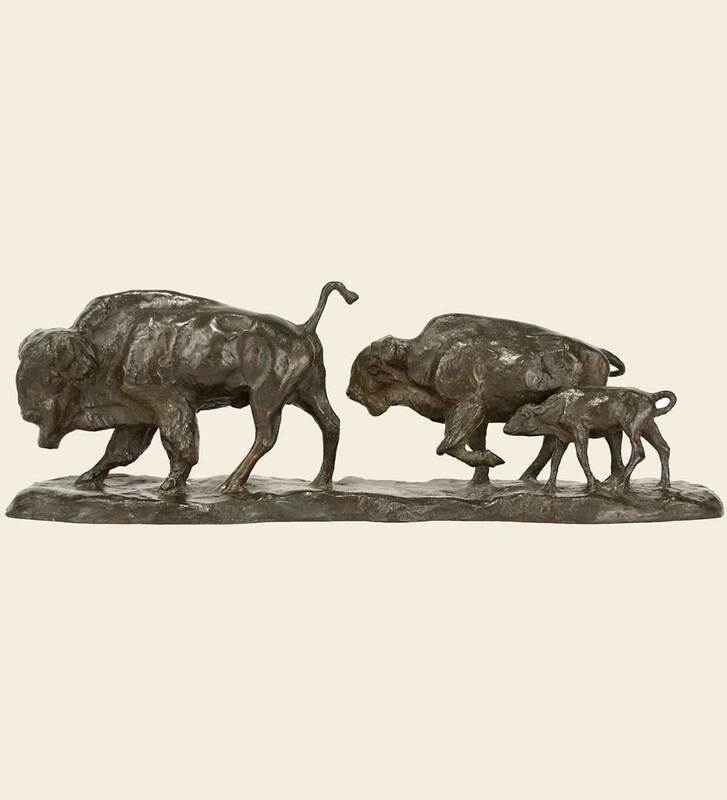 As the two cowboys at the rear struggle to keep their feet, the figure nearest us plants his, and the effect is as if he is trying to weld his feet to the Western earth as he readies himself to throw his lariat. 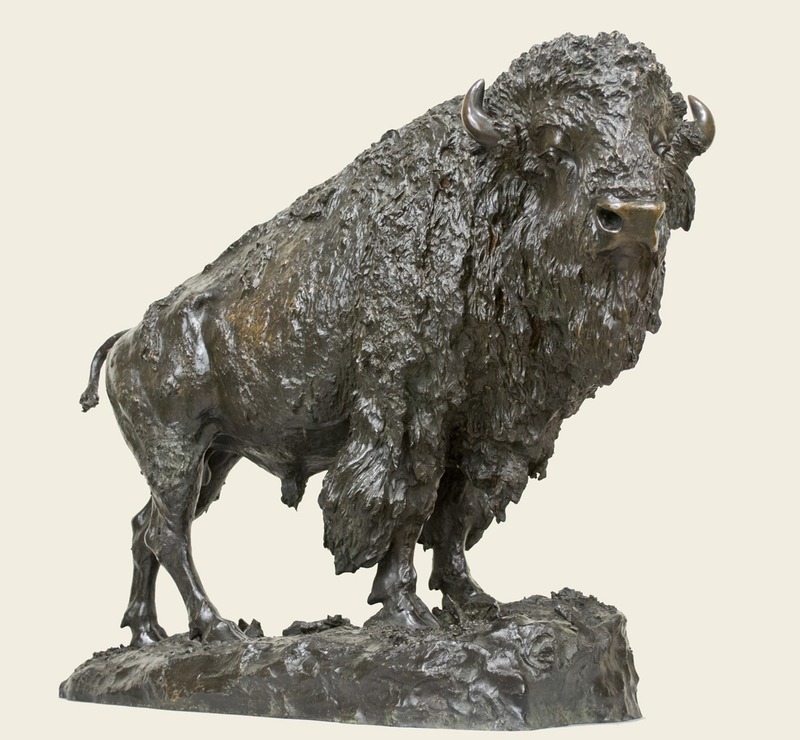 American, Western and Sporting Art for over 60 years. 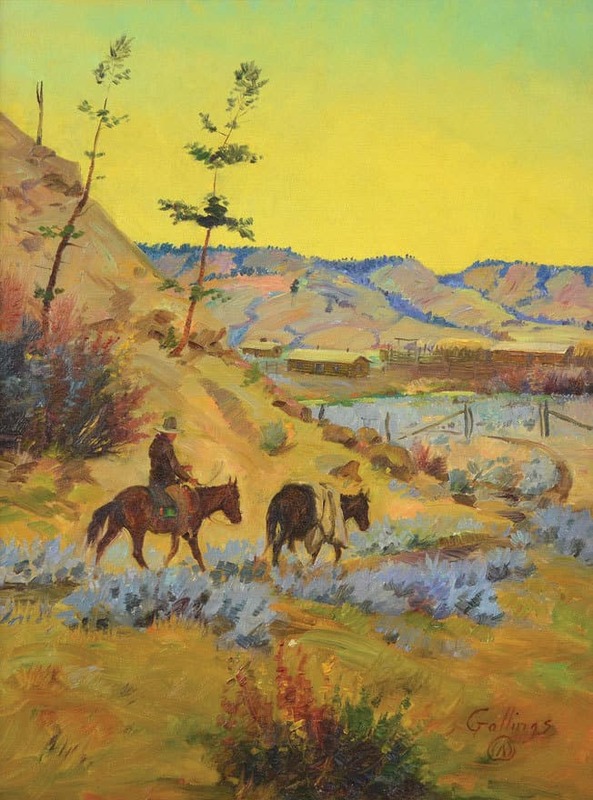 Our inventory ranges from the early 1800s to the present and includes such artists as Remington, Russell, Farny, Leigh, and The Taos Society of Artists. 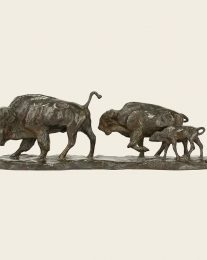 We also feature select Contemporary Western and Sporting art; quality books and manuscripts of virtually every collecting category. 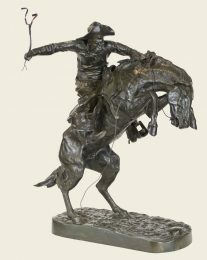 One of the numerous outstanding works by Frederic Remington that we have sold is The Lone Scout, a 20 x 26 inch oil executed in 1906, when the artist had mastered his media and reached the summit of his artistic powers. 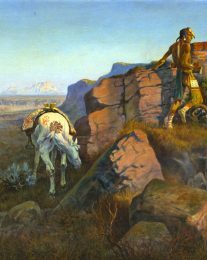 The single Native American in a desolate and forbidding landscape watches over a thin waterhole that juts into the picture plane opposite his horses nose. Dry scrub provides scant relief for the viewers eye and the alkali mountain ridge beneath a hot, cloudless blue sky is almost Martian in aspect. The darkest and most palpable element in the painting is the shadow of mount and man. Where we would wilt, the braves remarkable vigilance forms the core of the work. 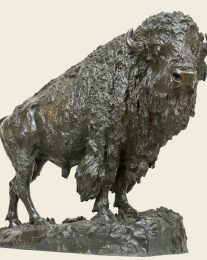 Charles M. Russells most impressive and iconic 1914 oil, Whose Meat?, depicts the first moments in a standoff between man and the beast that walks like a mana grizzly bear. The hunter, having just shot a bighorn sheep, sees an upright grizzly closing on his game. 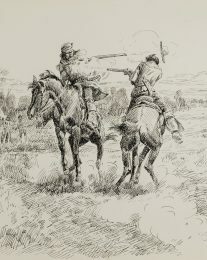 Holding his shying horses, he tries to mount his rifle. The moment is supremely tense, and Russell deftly heightens this by positioning the hunter on a slope of slippery boulders backed against a cliff face. Snow on the ground and the clouds rising behind the bear hint at a quick squall that might belie the beautiful snow-capped, sun drenched peaks in the distance and obscure the scene in freezing fog. Whose Meat? becomes What Next? The majesty of Yosemite was one of the many spectacular natural wonders Hudson River master Albert Bierstadt painted. In 1866, Bierstadt was commissioned to paint a picture for the rotunda of financier Le Grand Lockwoods home in Norwalk, Connecticut. Before the finished painting, Domes of the Yosemitewhich measured 9 1/2 x 15 feetleft the artists studio, Bierstadt painted this smaller version so it could be reproduced as a chromolithograph. With great attention to textures, he gives us a view of Upper Yosemite Falls on the left and the Merced River winding its sinuous way toward Half Dome. 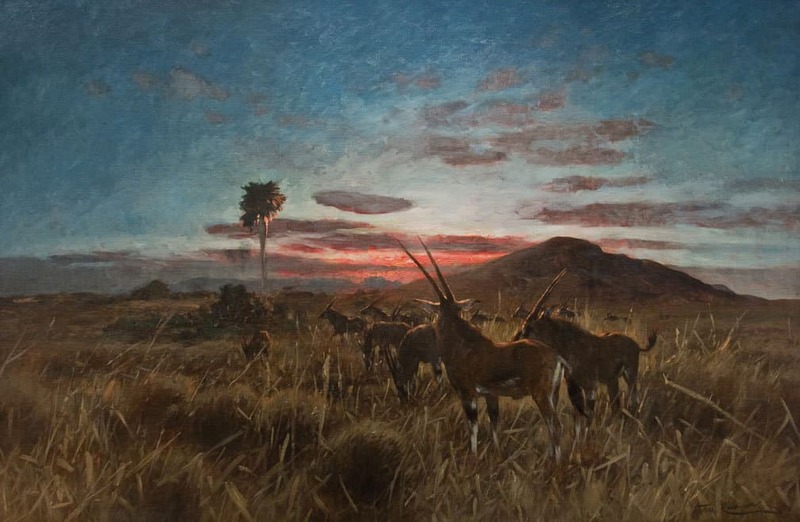 The shafts of light and the framing of the composition give the effect of a window into a lost Eden.